Sub-Saharan African countries have experienced some of the highest economic growth rates globally over the past 10 years. While this means that people in these nations tend to be more satisfied with their current economies and more optimistic about their economic future than other people around the world, they still face myriad problems. In addition to unemployment, broad majorities rank health care, education, government corruption, crime, access to clean water and energy shortages as some of the biggest issues their countries face. When asked what their nations should focus on improving for the future besides the economy, health care and education emerge as clear priorities. Majorities of Ethiopians, Senegalese, South Africans and Nigerians say their economy is doing well. Tanzanians and Kenyans, however, are divided over current economic conditions. 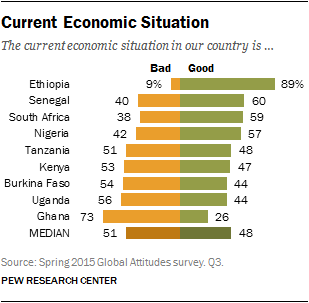 And more than half in Ghana, Uganda and Burkina Faso are unhappy with the economy. Despite negative sentiment in some countries, publics in this region tend to be much more content with their current economy than other people around the world. A median of 48% across the nine countries surveyed say their economy is doing well. Fewer than four-in-ten in Latin America (median of 36%), the Middle East (31%) and Europe (28%) say the same. Americans are also down on their economy (40% good). Only in the Asia-Pacific region (median of 51%) are economic sentiments somewhat more positive. Attitudes about the economy are driven strongly by recent economic performance. Publics that experienced higher levels of economic growth in 2014 are much happier with their current economic conditions. In the nine sub-Saharan African countries surveyed, the median GDP growth last year was 5%, somewhat lower than the Asia-Pacific countries surveyed (6%) but much higher than any other region. Many people in sub-Saharan Africa are optimistic about the future. A median of 60% across the nine countries surveyed say their economy is going to improve in the next 12 months, and 56% believe the next generation will be better off financially than their parents. This is a much higher level of optimism than expressed by many others around the world. Similar to attitudes about the economy today, opinions about the future are also affected by the nation’s economic performance. Across the globe, publics who have seen their economies grow consistently over the past decade are much more likely to believe that their children will face a brighter financial future. For example, Nigerians experienced an average of 7% GDP growth between 2005 and 2014. 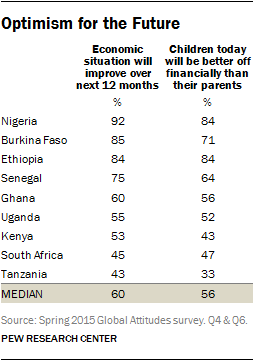 More than eight-in-ten in Nigeria say that children in their country will do better financially than their parents. Meanwhile, average GDP growth over the past decade in France has been 1% and just 14% say the next generation will be better off. In some sub-Saharan African countries, young people are happier with the economy and more optimistic about the future than their elders. This is particularly true in Kenya and South Africa. In Kenya, young people ages 18 to 29 are more likely than those ages 50 and older to say that the economy is doing well (52% vs. 41%), that the economy will improve in the next 12 months (59% vs. 44%) and that children will be better off financially than their parents (49% vs. 33%). Similarly, young South Africans are happier with the economy than their elders (+12 percentage points), more optimistic about the next 12 months (+18) and more hopeful for the next generation (+13). 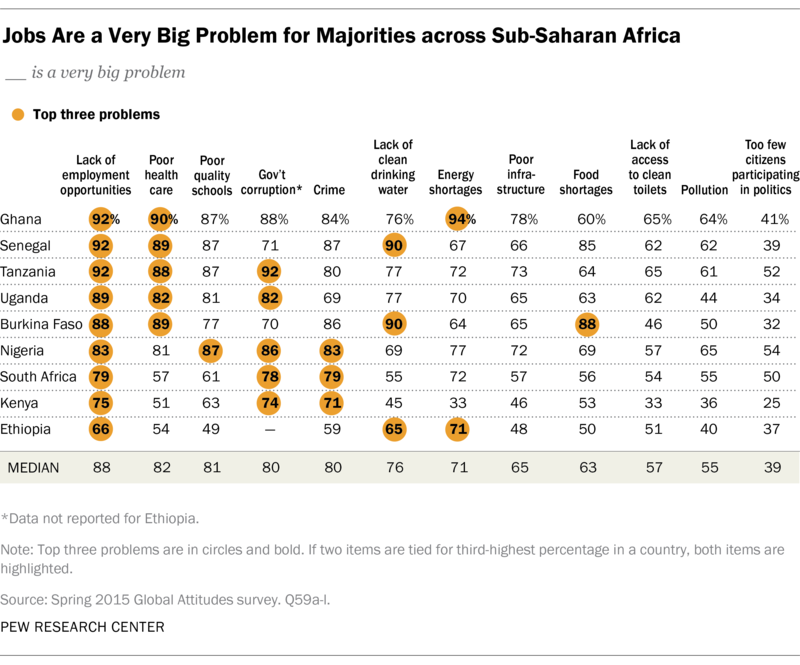 Sub-Saharan African publics are concerned about a range of issues in their country. In each of the nine countries surveyed, a lack of employment opportunities ranks as one of the three most important problems. A median of 88% across all nine countries say jobs are a very big problem in their nation, including 92% in Ghana, Tanzania and Senegal. Beyond the economy, however, publics in the region face many other challenges. A median of 82% say poor health care is a very big problem. The quality of health care is seen as one of the top three problems facing the country in Ghana, Senegal, Burkina Faso, Tanzania and Uganda. Education also tops the list of problems with a median of 81% citing it as a major concern. Nigerians rank poor-quality schools among their three biggest worries. Government corruption ranks as a very big concern (median of 80% across eight countries asked the question) and is among the top three problems in Tanzania, Nigeria, Uganda, South Africa and Kenya. Broad majorities also say crime (median of 80% across all nine countries) is a very big problem in their country. Crime ranks among the top concerns for Kenyans, Nigerians and South Africans. Somewhat lower down the list of concerns, though still considered major issues, are lack of access to clean drinking water (median of 76%) and energy shortages, such as electricity blackouts or fuel scarcity (71%). A lack of clean water is cited as one of the three most important problems in Senegal, Burkina Faso and Ethiopia, while energy shortages rank among the biggest three worries in Ghana and Ethiopia. Fewer people – though still majorities – express concern over poor infrastructure (median of 65%), food shortages (63%), lack of access to clean toilets (57%) and pollution (55%). At the bottom of the list is the issue of too few citizens participating in politics (39%). None of these concerns ranks in the top three for any public surveyed, except for food shortages in Burkina Faso. In most of the countries polled, people who live in urban areas are more concerned than those in rural areas about crime and government corruption. There is an urban-rural divide over the problem of crime in South Africa (+15 percentage points), Senegal (+13), Ethiopia (+11), Ghana (+10), Uganda (+10) and Burkina Faso (+8). Similarly, those in urban areas are at least 10 points more likely than rural residents to say government corruption is a very big problem in Senegal (+18), Burkina Faso (+15), Kenya (+12) and South Africa (+12). In Nigeria, opinions about the country’s challenges vary somewhat along ethnic lines. Respondents from the Igbo and Yoruba ethnic groups are generally more likely than Hausa respondents to describe the issues included on the survey as very big problems. 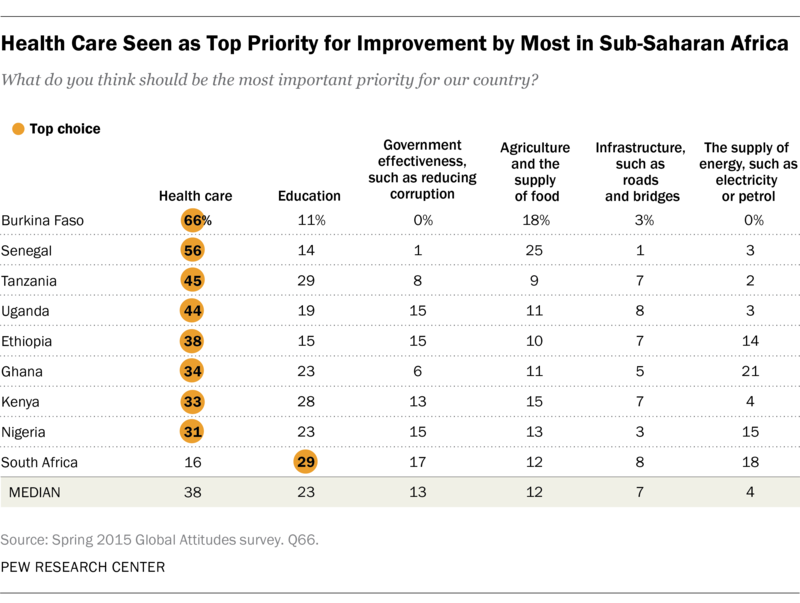 When given the option of six areas for improvement in their country beyond strictly economic issues – health care, education, governance, food supply, infrastructure and energy supply – pluralities or majorities in eight of the nine African countries surveyed say health care is their top priority (median of 38%). In South Africa, education ranks as the most important issue. Overall, a median of 23% across the nine countries say education should be a first priority. Addressing government effectiveness, such as reducing corruption (median of 13%), is a somewhat lower priority, as is improving the supply of food (12%). The share ranking government effectiveness as their top priority is highest among South Africans, while Senegalese and Burkinabe are the most likely to say it is very important to address the food supply first. At the bottom of the priority list are investing in infrastructure, such as roads and bridges (median of 7%) and improving the energy supply within the country (4%). In a few countries – Ghana, South Africa, Nigeria and Ethiopia – energy supply ranks much higher than it does elsewhere. No more than one-in-ten in any nation say infrastructure should take top billing. When asked which among these six issues would be their second priority to improve, publics are generally split between education (median of 30%) and health care (25%). Food supply also is seen by many as a secondary priority (16%). Government effectiveness (8%), infrastructure (8%) and energy supply (6%) continue to be seen as less important. Within countries, there are some clear demographic differences over the importance of certain issues. Young people, ages 18 to 29, place a higher priority on addressing education than those ages 50 and older in Tanzania (+10 percentage points), Kenya (+10), Burkina Faso (+10), South Africa (+8), Ethiopia (+7) and Senegal (+6). In Senegal and South Africa, lower-income individuals are more likely than higher-income people to say that the food supply should be a top priority (+10 and +7, respectively) and less likely to say education is most important (-5 and -9, respectively).1 Finally, in South Africa, whites (27%) and people who are mixed-race (25%) rank addressing government effectiveness as a much higher priority than blacks (14%).